Gpredict is different from other satellite tracking programs in that it allows you to group the satellites into visualization modules. Each of these modules can be configured independently from the others giving you unlimited flexibility concerning the look and feel of the modules. Naturally, Gpredict will also allow you to track satellites relatively to different observer locations – at the same time. Gpredict is free software licensed under the GNU General Public License. This gives you the freedom to use and modify gpredict to suit your needs. Gpredict is available as source package as well as precompiled binaries available via third parties. 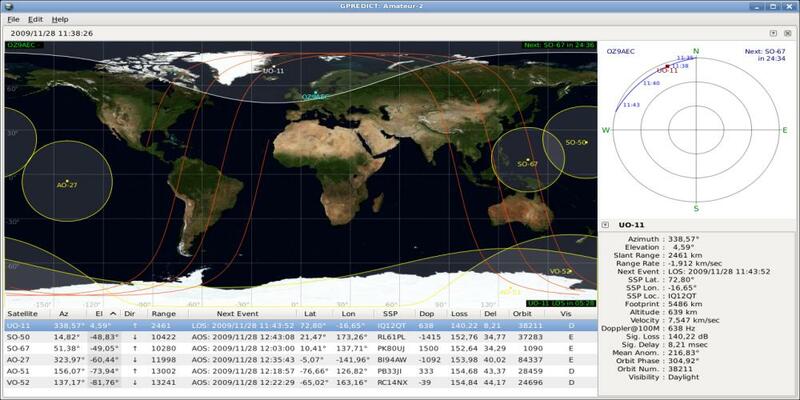 Fast and accurate real-time satellite tracking using the NORAD SGP4/SDP4 algorithms. No software limit on the number of satellites or ground stations. Appealing visual presentation of the satellite data using maps, tables and polar plots (radar views). Allows you to group satellites into modules, each module having its own visual layout, and being customisable on its own. Of course, you can use several modules at the same time. Radio and antenna rotator control for autonomous trakcing. Efficient and detailed predictions of future satellite passes. Prediction parameters and conditions can be fine-tuned by the user to allow both general and very specialised predictions. Context sensitive pop-up menus allow you to quickly predict future passes by clicking on any satellite. Exhaustive configuration options allowing advanced users to customise both the functionality and look & feel of the program. Automatic updates of the Keplerian Elements from the web via HTTP, FTP, or from local files. Robust design and multi-platform implementation integrates gpredict well into modern computer desktop environments, including Linux, BSD, Windows, and Mac OS X. Free software licensed under the terms and conditions of the GNU General Public License allowing you to freely use it, learn from it, modify it, and re-distribute it. If you compile Gpredict from source you will also need the development packages often with -dev or -devel in the package name, e.g. libgtk-3-dev.